“What did you like about the book? Sami, a recent Syrian refugee, explores his very powerful, personal perspective of the pain, healing and hope of his resettlement ordeal. Suzanne Del Rizzo’s incredible attention to each detail in the story line, dialogue and exceptionally detailed polymer clay and acrylic art work of the landscape and living conditions, beautifully combines to allow the reader to absorb the profound emotional loss that Sami has experienced and continues daily. The hopeful symbolism of reconnecting with his beloved birds begins his self-healing process that takes flight in the community and spreads as he welcomes his newest refugee friend. I appreciated that the book did not explain, blame or discuss any political themes, leaving these questions outside Sami’s innocent mind, allowing him to focus on reality, humanity and survival. I hope this book inspires others to realize the daily plight of refugees. I appreciated the “Author’s Note” on the last page that simply outlined facts about the refugee crisis, sadly noting that half of those displaced are innocent children like Sami. Anything you didn’t like about it? NO, it was well thought out and executed beautifully. “My son and I both loved this story and the dimensional illustrations that the author created through Plasticine, polymer clay and other mixed media. 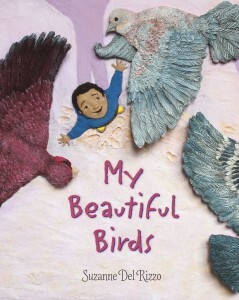 The birds especially are so detailed, they come alive and seem to pop out of the pages. Every page was a delight to explore. Truly a work of art…. Although this is a story about war, it is hopeful and uplifting. It helps young ones to understand what is happening in our world and how we all have the same needs. A variety of emotions are explored in this book: sadness, fear, anger, hope and compassion. It’s a book that can open up dialogue between parent and child. “My heart was so touched by this poignant story…It’s a gentle, moving book that parents can use to help their own children to understand the world in which they live.